This was the perfect option for my family. We have a 9 month old and a 3 year old. 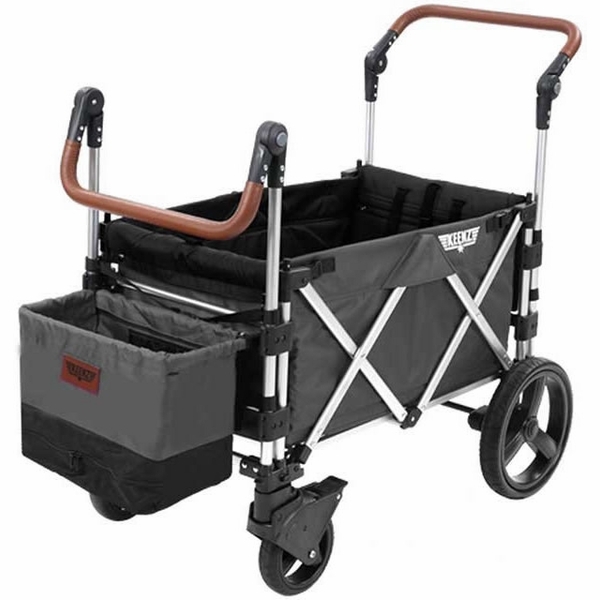 Looking at double strollers, and discovered this stroller wagon! It fits well in my small sedans trunk, will work well for us for years to come, love all the bells and whistles. So well made, and the kids love it. My daughter bought this with intention of using it at Disney, but a few days after delivery Disney announced they would no longer accept these stroller wagons. However, she is still pleased with it and intends to take it to other theme parks that aren't so restrictive. She finds it handles well for its size and has several features that will be useful. The children are approaching 6 and 3 and fit in it together quite comfortably. Iâ€™m very happy with my purchase and canâ€™t wait to make full use of the keenz! This wagon is such a great and worth the money purchase! With all the extra accessories it comes with Iâ€™d recommend to wait to get the wagon before purchasing any others you think youâ€™ll need. I only purchased a snack pod since thatâ€™s one thing I noticed it didnâ€™t have. But with Albeeâ€™s 20% off it saves you ton therefore it was a must through this site. One happy mama and tot! 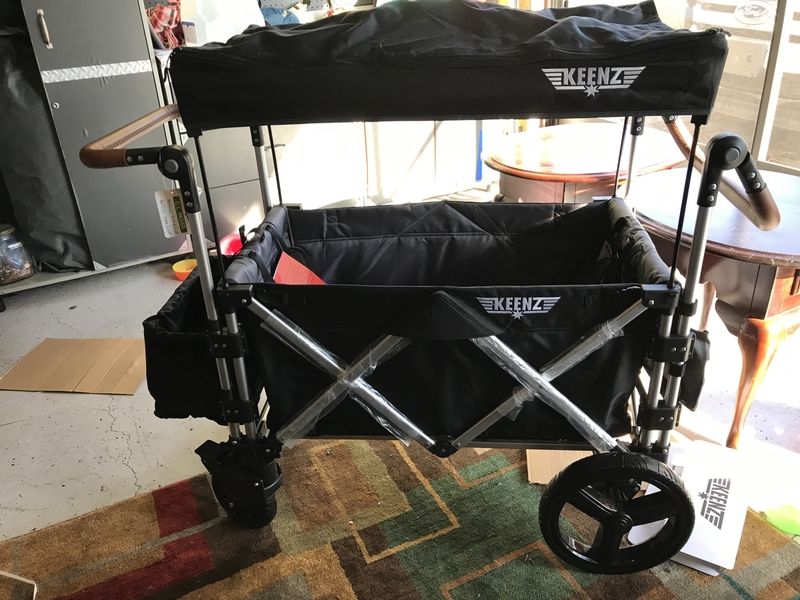 We have loved using the Keenz 7S Stroller Wagon. We have twins and it is much easier to get them in and out of the wagon than a traditional stroller. Also if they are not strapped in there is plenty of room for their older brother. We have also fit all 4 kids who are 7, 5, 2, and 2 in the wagon. The twins feet do touch if they are strapped in but they don't seem to mind. Highly Recommend! ProsEasy to open and close. Easy to get kids in and out of. Not too heavy compared to a double stroller. Our oldest daughter plays travel softball and regular season softball so we are always on the go. Iâ€™m currently 5 months pregnant and we have a 14 month old. Our 14 month old hated the stroller. The first time we put her in the wagon she cried when we took her out, still does every time, she hates getting out. She loves being able to sit up, play with her toys and books while riding. I can change her diaper while she is laying down inside of this and she can also nap. The shade is another amazing feature, it helps block out the sun and some of the sharp wind. This is well worth the money 100%. We decided to purchase this and not even worry about a double stroller. 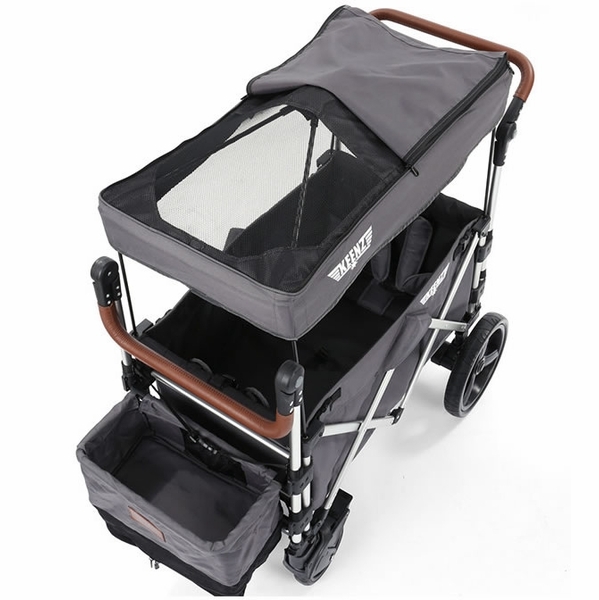 We are in love and amazed with this Keenz stroller wagon. We are always getting asked about the wagon when out. A MUST HAVE for moms of multiples!!! I sold my beloved City Select stroller to give this wagon a try as a replacement. We have 1 year twins, along with a 4 and 7 year old. I wish I had purchased this wagon sooner. If I could turn back time, I would go straight from a snap and go stroller to this wagon, and never buy any other stroller. 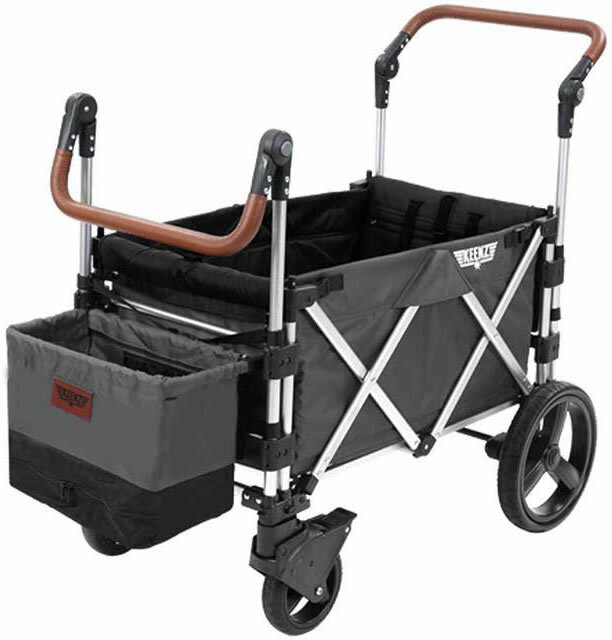 The wagon folds easily with one hand, which is a huge bonus if you are carrying kids and all their items! It takes up about the same amount of space unfolded as the City Select double stroller did unfolded, but folds MUCH more compact. 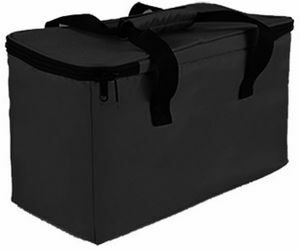 It holds MUCH more; I can fit all 4 of my kids in the stroller, with gear for the beach, diaper bag, snacks, chairs, and a cooler. It holds EVERYTHING! The canopy keeps them in the shade, and we also purchased rechargeable fans to clip on for added coolness. Even on 100? days, my kids stay cool. It has been FAR superior to other folding wagons we have looked at and tried, and has been worth every penny. Ironically, it is much cheaper than our City Select double was! Strongly recommend this stroller to anyone with 2+ children!!! Not only was I amazed at Disneyland when I saw this wagon and decided I had to have one Albee gave me the best deal on it. The customer service was amazing my brake pad wasnâ€™t fitting correctly and they sent me a new one ASAP! Theyâ€™re simply amazing!!! This wagon is a dream - easy to maneuver, plenty of room for the kids (and they love it!!! ), the seat belts are amazing for one of my scrummy little boys, and the cooler and ice chest are the icing on the cake! My youngest loves to lay down in it when heâ€™s tired and take a nap. Iâ€™m just waiting for the all weather cover to come in now and Iâ€™m hand making cushions for it!!! I absolutely love this wagon! My only regret is I didnâ€™t buy it sooner!!!! ProsEverything!!!!! 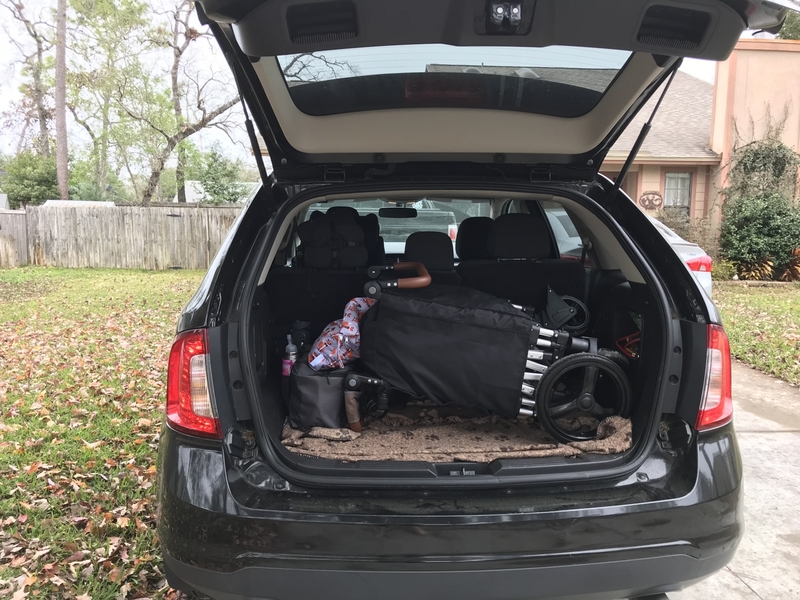 Love the space, the seat belts, how I can fold it up, the storage, (I got the hooks and those are amazing for attaching your diaper bag and my goddaughter even used it to attached her iPad too which she watched a movie while chilling in the wagon. Absolutely love love everything about this wagon! Can?t wait for the rain cover to come in! ConsNeeds more accessories but I found them on amazon- I bought a fan and light for the inside :) it?s prefect for Disneyland! I saw a keenz in person about a month ago and had to know more. After some research I knew it would be a perfect fit for our family. I bought it here on Albee Baby because I had a good experience with purchaseing my car seat through them. I absolutely love my Keenz itâ€™s everything and more! You get all the accessories pictured including the thermal bag. I canâ€™t recommend it enough. I use it daily on my walks and shopping at the store. ConsWish it had a little more padding in the bottom and back for the little ones who are riding in it, it would be nice if it came with the update wheels and all weather cover as a package. This stroller wagon is hands down amazing!!! So much storage and very smooth ride!! Iâ€™m so glad I made this purchase! Get one!!! A bit pricey but worth it...the kid loves it & so does the pup! We absolutely love this wagon! My son is one and he loves being inside it. 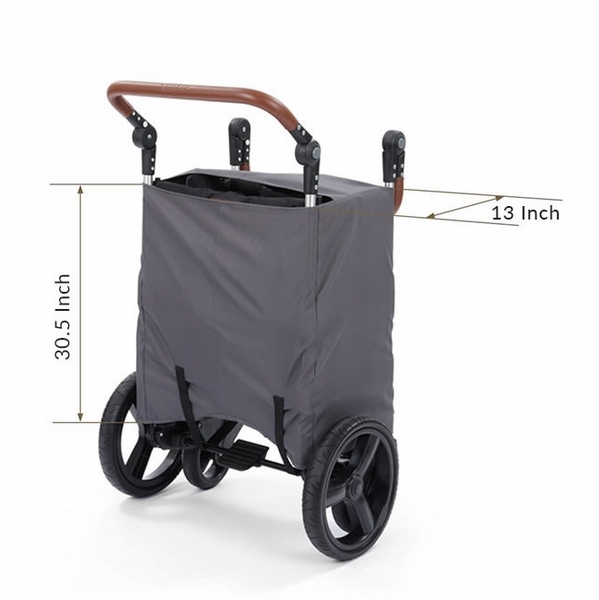 It is easy to push (we took it out Halloween and were able to easily push it up everyoneâ€™s driveways/sidewalks and even onto peopleâ€™s porches). It has a ton of space. 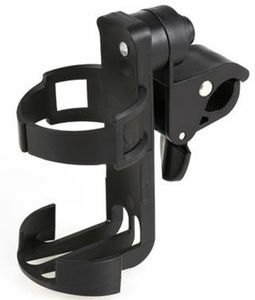 The adjustable handles make it easy for my husband or myself to maneuver. We are so happy with this purchase. We love our Keenz. My 2 boys are more than 30 lbs apart in weight, which made a regular double stroller very difficult to push. I am able to maneuver them easily in here, and they are comfortable. When I just have my youngest home during the school day, we still often use the wagon to get shopping done, since he is happier (and cleaner!) than riding in a store cart. ProsGood size, kids like riding in it, many ways to customize it for use, quick & easy to fold once you get the hang of it. ConsLarge and heavy, but no more so than a double tandem stroller. Best UsesEveryday use at stores, walks, and great for theme parks. This wagon has a great push, steers well, and holds a lot. Recommend getting the all weather cover also if you plan to use it when it is cold or raining. I was hesitant to buy due to the price but Iâ€™m so glad I splurged and bought it!! 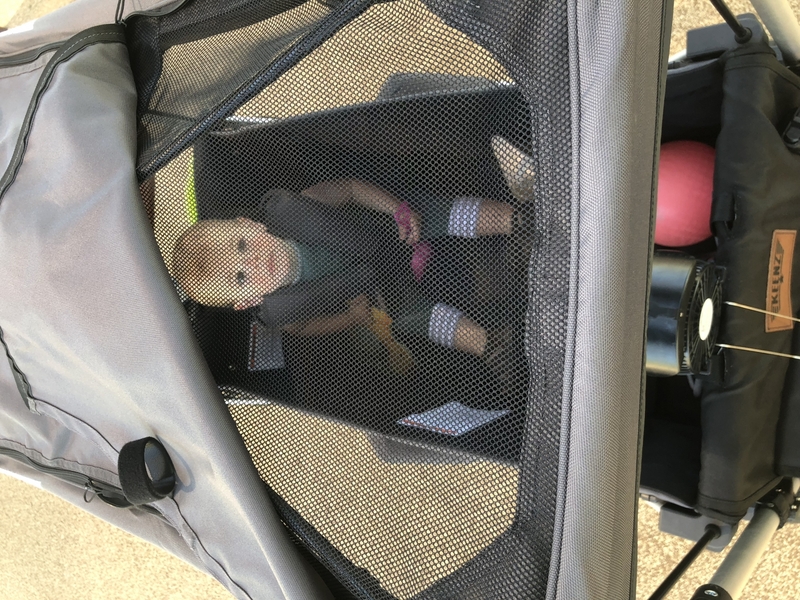 Itâ€™s glides and turns so easy just as a stroller and my 10 month loves to sit back and relax! The 5 point harness is great for our ones that are still too little to understand they canâ€™t stand while the ride is in motion!!!! The added pockets and cooler are great!! It also folds up so easy! Havenâ€™t tired it in the beach yet but fingers crossed Iâ€™m hoping all goes well next year! This definitely will come in handy when we have two kids! I highly recommend!!!! Nice product. Fast shipping. Smooth transaction. Can't say enough about this wagon. Easy set up and even easier to use. Very comfortable for my children (ages 3 and 1) and love the fact that you can bring it to Disneyland! It was great for my son on vacation and it is so spacious and convenient. The basket for the cooler was amazing! Best thing since sliced bread!!! We ABSOLUTELY LOVE our wagon. Itâ€™s convenient in so many ways and has great features. So many people were looking at it and asking me questions about it. 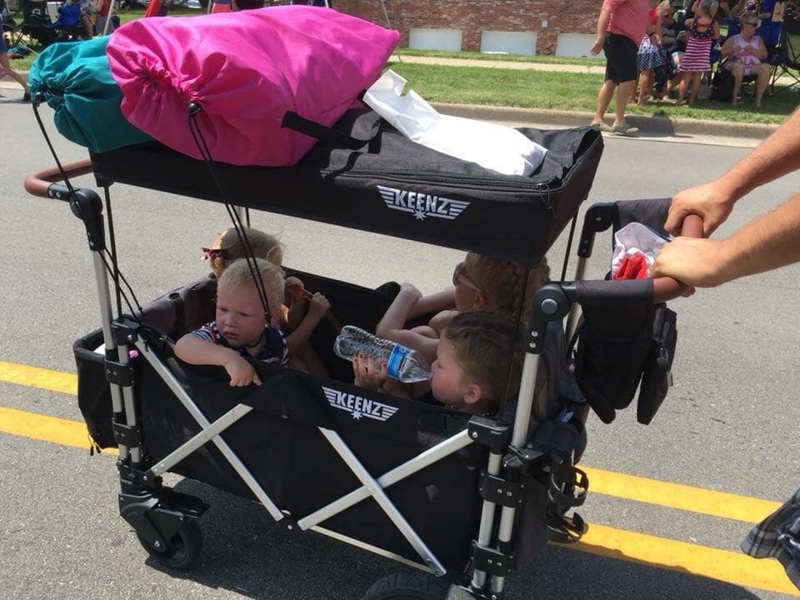 I saw every parent that had a stroller checking it out this weekend and overheard them saying thatâ€™s what they need at a local event we attended. ProsEasy to fold up and easy to open. Fits great in the trunk of my SUV and doesn?t take up too much room. We've taken this all over, to the zoo the beach and everywhere in between! My daughter(2) can nap in here and the outside totes store so much!! I bought this to use for my 3 kids (ages 4,3, 7 mo). The girls love it and it's sturdy. It also stores well. I use it more than my double stroller! Comes in handy when I have soccer practice with my kids or even just to go for a walk at the park. And everyone complements me about it out in public. 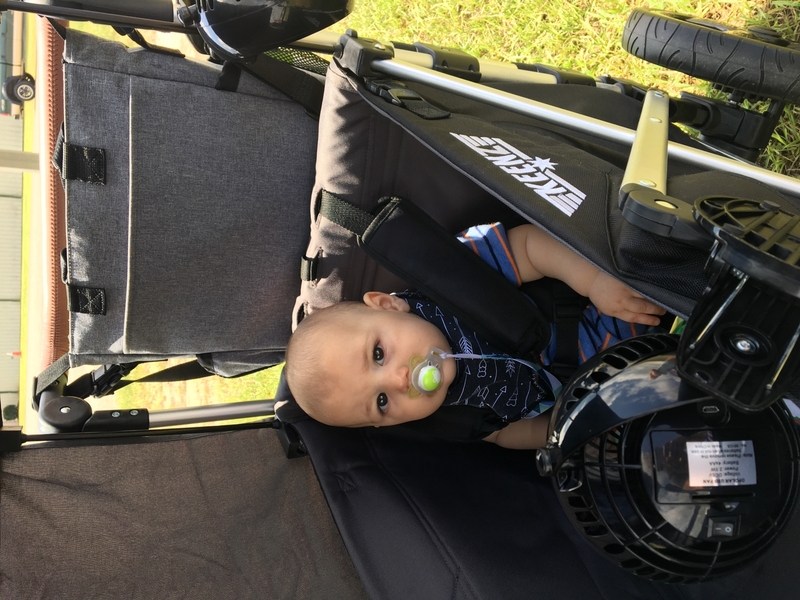 great overall stroller/wagon, a bit heavier than people in YouTube reviews made it seem, and bulkier too, but once opened and using it, it has so much storage and everything about it is convenient... it was a great buy for me. *win! 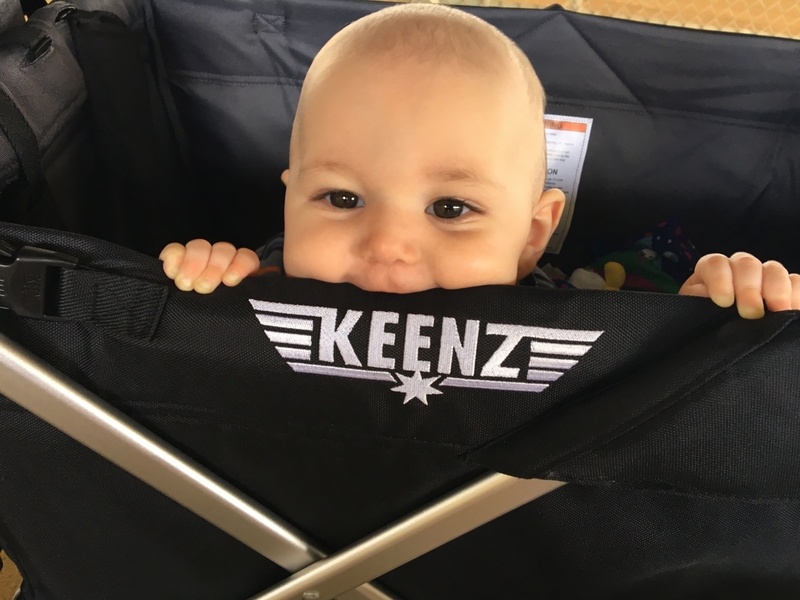 I don't typically take the time to write reviews, but our Keenz is our new must-take stroller/wagon everywhere we go. We took it camping recently and were stopped by so many people who wanted to know more about it! It comfortably fits my two kids and all of their gear and it gives them room to play and snack while we are on the go! Loving our Keenz! 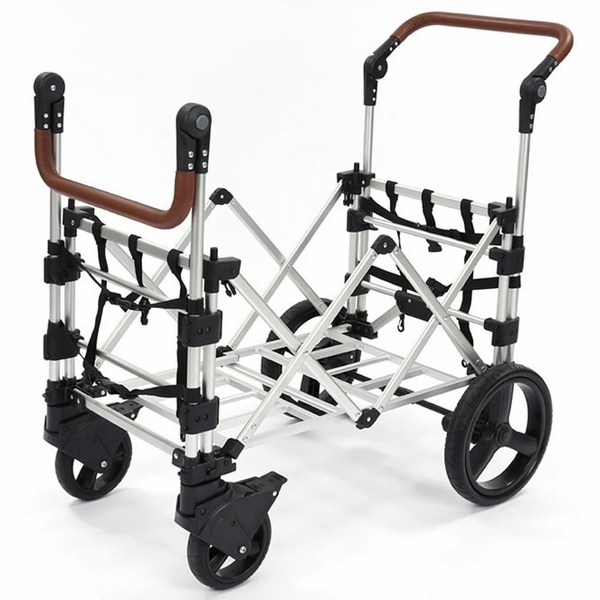 Packaged really well, quick and easy to assemble, and overall a joy for us to use when walking to and from the parks. My husband and I were debating on purchasing this item but are now so glad we did. We have absolutely no regrets. I love all the compartments and addes features. My husband loves the durability and the smooth maneuverability. We highly recommend! Great compact option for a wagon! I had originally purchased a Radio Flyer wagon knowing I wanted a wagon for the beach, zoo, etc. After I got it home I realized what a pain it would be to load in my SUV and how much space it would take up! Well Keenz came to the rescue. It's more compact and has more options than a standard wagon. I have a 3 year old and a newborn. I found that I prefer to wear my newborn than to leave him in the car seat/stroller on all of our excursions. Therefore this is double stroller we are still growing into, but it also give my baby a safe and shady place to kick and stretch. I am able to change his diaper anywhere with the flat surface. I don't know if my husband or theee year old love it more. It is comfortable ride just as it is easy to push. It is light and easy to fold and load into the car too! I think I could go on and on about this product. I am so thankful I took the plunge to order it!! I love the quality of the Keenz. It's fantastic for older children who don't want to be in a stroller anymore. My 2 year old son also prefers to ride in the wagon rather than in a stroller. I do find it harder to fold and lift into the car than my double stroller. Best UsesTrips to the zoo or places like Disneyland. Albee had really speedy delivery on this amazing stragon!!! I could wait to use and it works out perfectly for my twin 5 year olds and1 year old!!! Our first real excursion was to the zoo and I got stopped no less than 15 times by people asking about it, a few moms even ordered it from their phones right then and there! A must have for families with several littles. This provide so many options and still plenty of room for supplies. I'm so glad I purchased the keenz wagon. I currently have 2 boys ages 9, and 2, and one on the way. My 2 boys fit great and are always begging to ride in the stragon!! I was really shocked with the room it has inside! The push is about the same as my not so great chicco stroller when both boys are in it (90lbs total) but it isn't terrible. I plan on getting the beach wheels soon. Gorgeous color, amazing stroller wagon! Plan on using it in my wedding and our summer activities! The stroller wagon is pretty awesome for hauling around a boatload of stuff for toddlers and big kids. I got it for a vacation trip that included all day outdoor walking and parade watching. The dog and 2 1/2 yr old rode in the wagon and benefitted from the canopy to keep out the sun. I attached a stroller board for the 6 yr old to ride on. Blankets and fold up chairs and snack foods and diaper bag all had a place to go. It was all so organized and easy to keep it all together. It fits through a single doorway, unlike other double strollers. It is a heavy monster to get in and out of the car. Not easy to fold and unfold compared to one handed strollers. For me, it's not a daily use stroller for walking the neighborhood or going to the grocery store. But it is absolutely perfect for soccer games, picnic in the park, parades, amusement parks, etc. I call it a "big kid" stroller because it's great for big kid activities. ProsHauling around a lot of stuff and multiple kids. ConsBig and heavy and requires 2 or more hands to setup and break down. This stroller/wagon is great! Both of my daughters love it and it's surprisingly easy to steer with two children in it. We plan on getting many years use out of it. ProsEasy to put together. Easy steering. Fits through doorways. ConsNot very padded for comfort. Included cup holder is really small. Best UsesZoo. Beach. Park. Everywhere!! Love my Keenz! 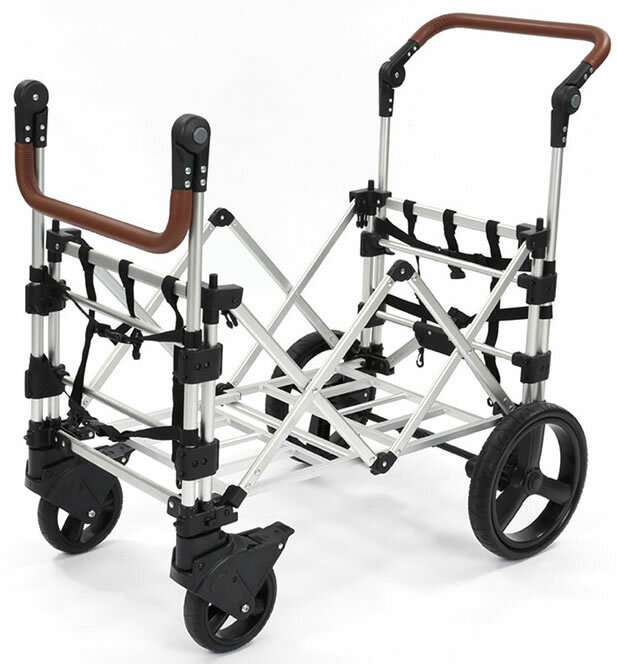 So easy to push my little guy around on walks or to the park. Can't wait to use it on all of our summer adventures!! ProsEasy to push. So much storage. Lightweight and easy to fold. Best UsesZoo, park, walks in the neighborhood. 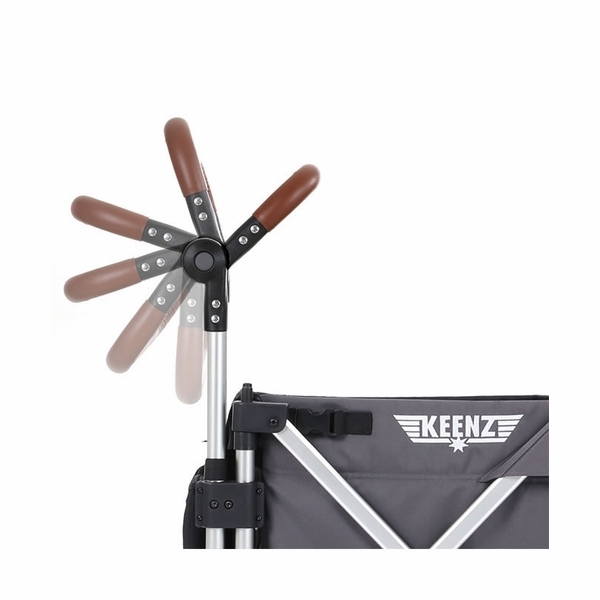 We love our keenz and use it daily. ProsFolds up nicely, pushes or pulls easily, has tons of space and room to lug stuff around! Kiddos LOVE IT! This is the best stroller or wagon whatever you want to call it. I can fit all 3 of my kids in this thing & still pushes better than my double stroller did! This stragon has been so much fun for us! We take it to the zoo, mall, park, beach, etc. our daughter loves to ride in it and the built in organization is great. The color is beautiful and it handles well. We get compliments on it everywhere we go! We have only had it a few weeks and LOVE everything about it! We have gotten stopped many times asking us where we got it!! It is a little on the large side but it can fit ALOT! 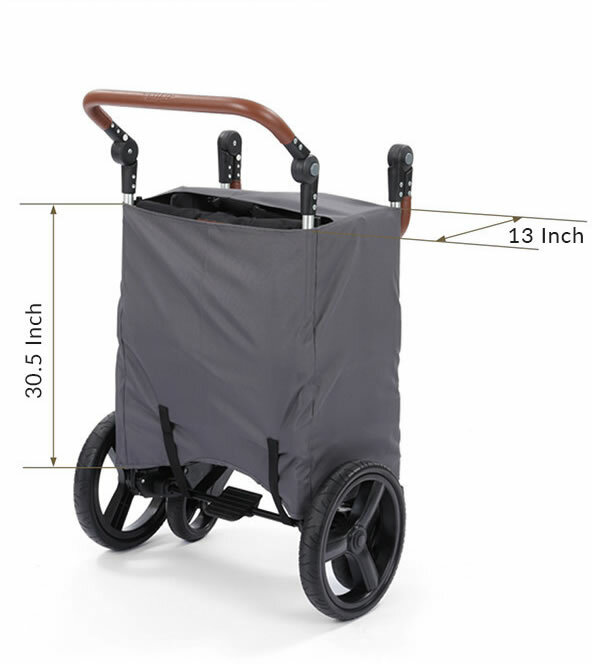 Easy to push, easy to open & close, and definitely makes trips to the zoos and amusement parks a breeze. ProsEasy to push and maneuver. Has stroller harness to keep small kids safe. Perfect for one or multiple kids. 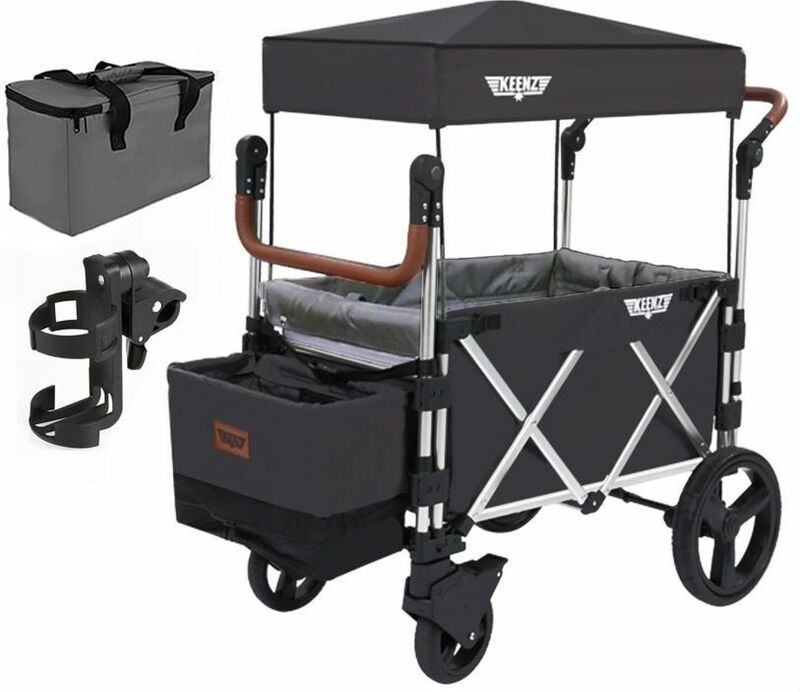 I am not a stroller person, so I started looking into wagons for my toddler and baby. Keenz is leaps and bounds above the competition. Setup took me 15 mins. I can unfold and fold in under 30 seconds. I can see us using this wagon for many years to come. Great quality. 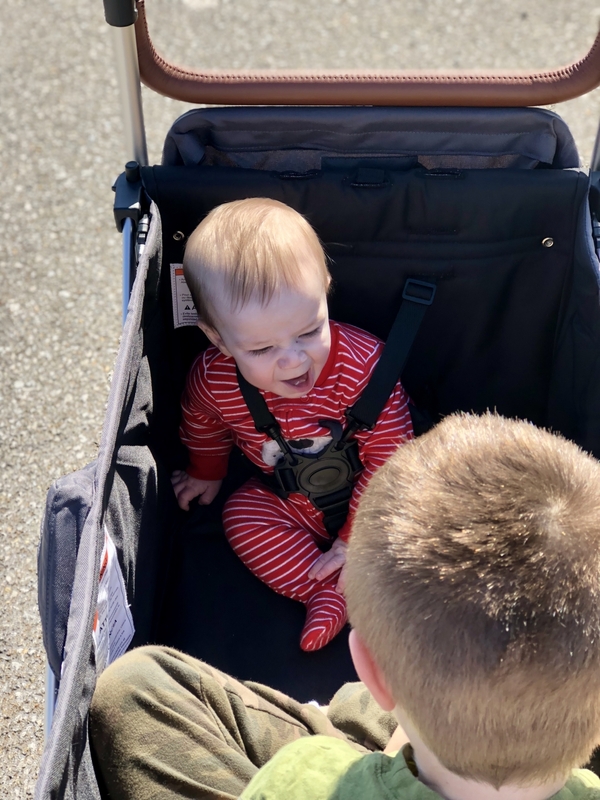 This stroller wagon has been a life saver- I have two kiddos under 3 and not only do they ask to go for a ride but they stay in - for hours!! Keenz has thought of just about everything. This is perfect for 1-3 kids. I have a 3 year old thats over 40lbs and Twin 2 year olds. They LOVE riding in this. Its much easier than a double stroller bc I don't have to strap them in unless we want to. Super easy fold, easy to maneuver, easier to pick up and put in the car. Fits through doors much easier than my double and I can pull it through easier. Very happy. 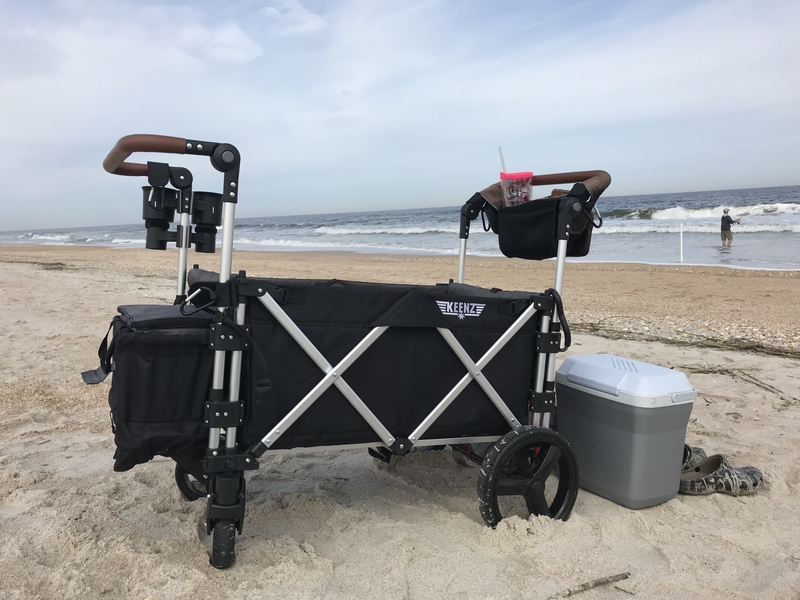 ProsQuick set up and fold, can be used to carry stuff, fits 1-3 kids easily (even 4 smaller kids), includes sun canopy, nice wheels, easy to maneuver. ConsLarge fold but no bigger than a full-size double stroller. Best UsesBeach, parades, shopping, parks. This stroller wagon is amazing! I handles off road conditions just like my favorite jogging stroller, has high side, and the 5 point harness is awesome! My 1 year old loves it as she is starting to resist going in a stroller. The spacious 7S stroller wagon has a weight capacity of 110 lbs. At only 32 lbs, the Keenz stroller wagon is light enough to maneuver easily. 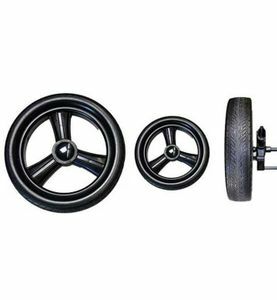 A spring suspension system on all four wheels makes the stroller wagon feel like its gliding rather than rolling on the ground. Folds down completely and fits in the trunk of most compact cars. Keenz is the first company who increased the functionality of the wagons and makes it remarkably better than any other brands. 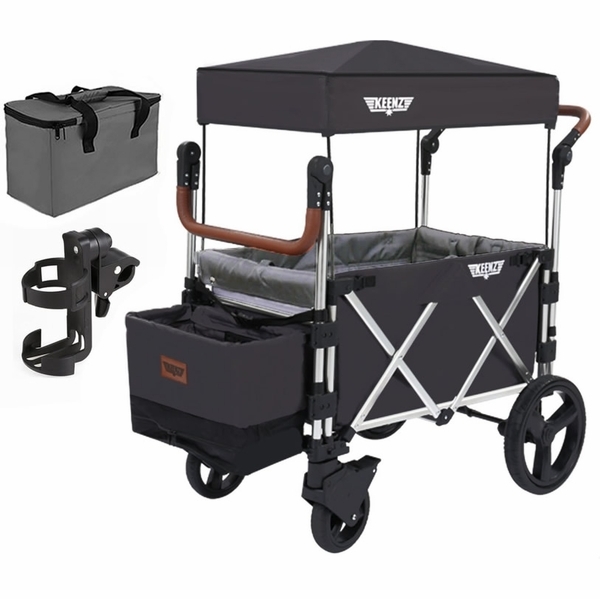 This premium-deluxe stroller wagon combines all the advantages from existing strollers and wagons pursuing ergonomic design. The 7s comes with a built in curtain and includes a canopy which is easily stored within the 7s itself. This canopy and curtain keeps your children out of the sun on those hot days that are still beautiful enough to visit a park. Parents are often forced to change diapers out in the open when restrooms aren’t available. 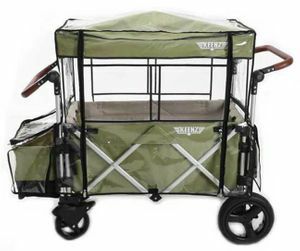 The issue of privacy is solved with the canopy and curtain that comes with the Keenz 7s Stroller Wagon. 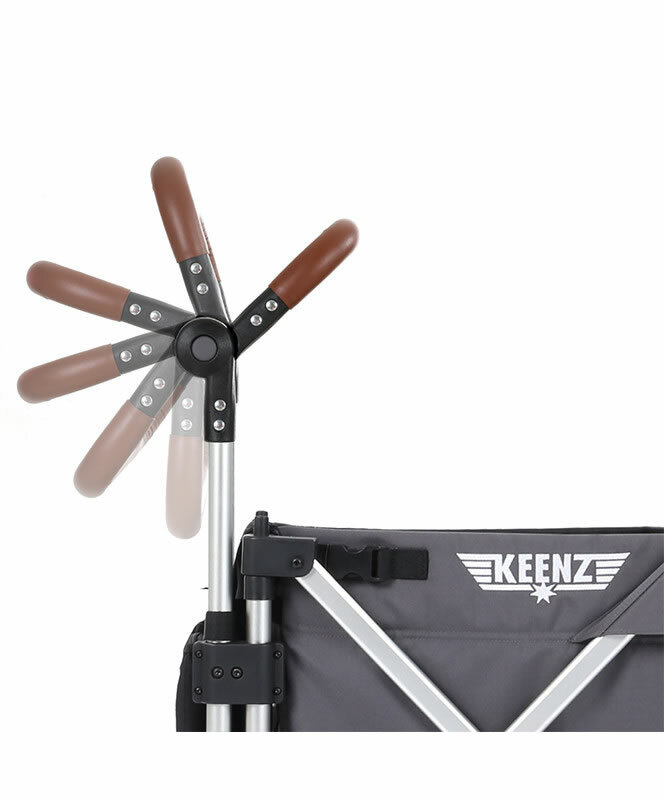 The Keenz 7s has a One Step On/Off Brake, allowing you to quickly and easily apply those breaks without having to adjust multiple wheels to get the stroller or wagon to stop. The 7s also has two 5-Point Safety Harnesses on each side of the stroller wagon, one of the key features that awarded the Keenz 7s Stroller Wagon placement in the Juvenile Products Manufacturers Association Certification Program (JPMA). The dual handle design is another feature unique to the Keenz 7s Stroller Wagon. Not only can you maneuver the 7s from either side, the handles themselves are adjustable. Shorten or lengthen the handles to fit your specific requirements. The 7s also has a spring suspension system on all four wheels, making the stroller wagon feel like its gliding rather than rolling on the ground. This make the 7s easier to push and control and it gives the children strapped inside a more comfortable ride. Don’t forget about the All-Terrain tires that come with the 7s.